This Monday I'm wearing a refashioned piece that started life as a top I bought while in Mexico in 2004. Yep, I tend to hold onto clothes even if I don't wear them because there is something about them I love. I loved the fabric of this top. I loved it so much that it didn't matter that it was not a flattering fit (not that I tried it on before buying) and made me look like I was wearing a frumpy maternity top! Mind you, on someone much shorter the waist would have sat at the waist and looked lovely, rather than under the bust like it did on me. 11 years later I decided to do something with it! 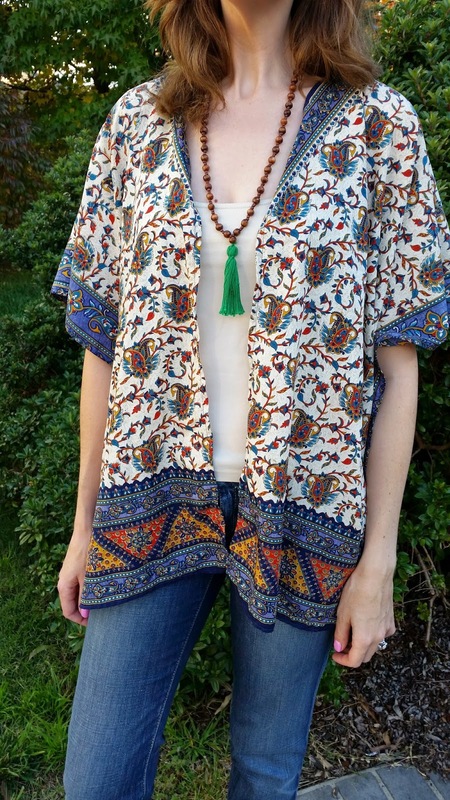 I love the Kimono trend and was going to make my own when I remembered I had this top stored away in a tote. Here is the basic outline of how I turned it into a Kimono from a frumpy mess (on me) into a fabulous Kimono that I've worn more in the past few weeks than I have in the past 11 years! Making sure you can see the pretty side detail! Have you got an article of clothing that you can't part with although you don't wear it? What could you refashion it in to?? So cute! I might need to try this for Summer! Thanks so much! 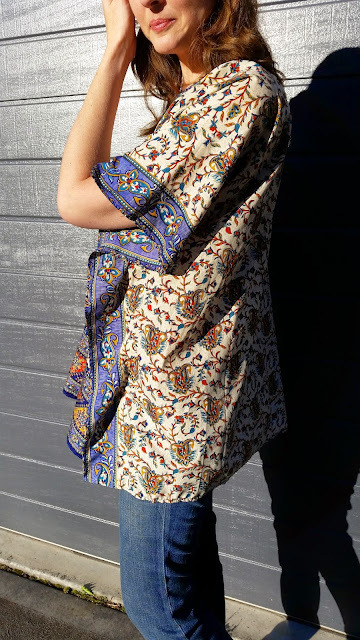 This is a really easy refashion and gives a new trendy life to an old top! For refashion I do put some old jeans I hate into new denim shorts or capris and they work out so well! Thanks so much! If you have a top that would work for this refashion you need to get it back! Refashioning jeans into capris or shorts is always a great idea. Old denim is always so much softer and nicer than buying new denim shorts. Thanks Beth! You're right - the reason I held onto it so long was because I bought it in Mexico! Yes! Drag out that machine! I hope to inspire others to sew with my blog and this was a really fast & simple project. I do love how it turned out as it was so not a good look on me before... too bad I didn't take a "before" shot! What a great way to re-purpose! I like what you have done and made such a great piece now! You are so clever for refashioning this top. It is a lovely fabric for a kimono.